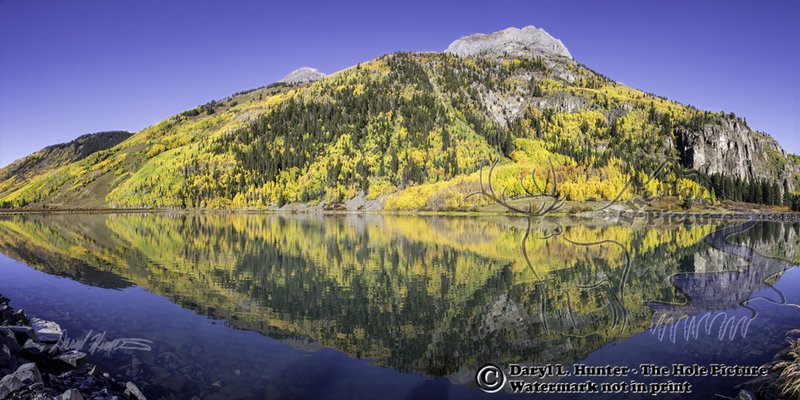 Autumn At Crystal Lake • Crystal lake is a pretty little gem of the San Juan Mountain Range south of Ouray, Colorado. It lies high on Red Mountain Pass and is a tough place to catch in good reflection. Autumn brings incredible changes to the alpine terrain in the San Juan Mountains of Southwest Colorado. Fall foliage glistens with golden leaves of the cottonwood and aspens, as well of the reds of the oaks. The proliferation of summer wildflowers has succumbed to the first freezes of fall subsequently turning the understory of berry bushes and sub-alpine tundra orange and ruby red. All this beauty is crowned by the stunning granite peaks of the largest mountain range in Colorado. For many a moon I had been wanting to photograph. The San Juan Mountains during autumn color, but unfortunately autumn color of the incredible landscape of Telluride, Ouray, Silverton and Durango is concurrent with my autumn in the Grand Tetons where fall color is the busiest season for my photo tour business at home. I have been perpetually trapped in the beauty of home. Oddly enough though in 2015 my early September bookings at home were good enough, as well as surprising dearth of bookings at the end of the month. Rationalizing this was a sign from God, I didn’t book anymore after the 22nd, and so in my faith of rationalization and pseudo divine intervention, I would finally see a Colorado autumn. I'm glad I finally made it.